The world of m-Commerce and mobile payments is constantly evolving with rapidly increasing customer needs. The importance of m-Commerce is further reinforced by the fact that more than 35% of the visitors to popular e-commerce sites prefer using an app rather than the web version. Along with m-Commerce, the mobile payment sector is also one of the most dynamic and fastest growing sectors of the global economy and supports different types of technologies and business models targeting various global markets. An increasing number of people are ready to adopt mobile payment options using various smartphones and wearable devices. The Future Market Insights predicts that between 2015 and 2020 there would be a 39% of CAGR growth in mobile payments. This massive growth cannot be neglected by businesses, and they must adopt the means necessary to attract new clientele while giving the older ones an impetus to stay with them. 1. Mobile Wallets: It is one of the most popular methods of mobile payment these days. Mobile wallets work with the "tap-to-pay" feature using NFC (Near Field Communication), or by letting you pay from an online wallet which is preloaded with cash. Payments made through mobile wallets are much faster and convenient as compared to paying by cash, and is a big reason behind their current popularity. Google Wallet, Samsung Pay, Apple Passbook are some of the more famous mobile wallets out there. 2. Direct Mobile Billing: This sort of billing has seen large adoption in countries where carrier billing and postpaid plans are in the majority. Here, once a customer purchases a product, the amount of the purchase is directly added to the mobile bill of the customer. This is a very popular method of mobile payment as it bypasses internet banking or the use of credit/debit cards. 3. Mobile Phone as a Credit Card Terminal: Mobile phones can now be directly used to read credit cards to make and receive payments. This method of payment is proving to be very beneficial for small business owners as it is a fast and secure method, and they do not have to pay exorbitant EFTPOS machine fees. Currently, this service includes PayPal Here and Square, amongst others, and can be easily activated by inserting the credit card reader into the headphone jack. 4. 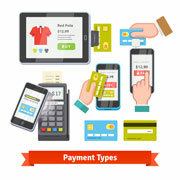 Mobile Web-based Payment: In this method of mobile payment, the consumer uses the internet or web pages or through any dedicated application installed on the phone. The underlying technology used for such payments is Wireless Application Protocol (WAP). This method is now being incorporated by many mobile network operators, with one of the most prominent services being provided by PayPal under the name of PayPal express checkout. These apps are mainly used to order a complete meal using just the mobile phone, or make restaurant reservations with pre-selected meals. This domain has tremendously grown in the past few years and even the professional hospitality industry has been creating forays into the mobile space after seeing the success of various enterprises such as Pizza Hut, etc. Today, such apps also reward customer loyalty by providing freebies or free meals/discounts, thereby leading to their further popularity. Mobile users can use these apps to search for theatres, shopping malls, restaurants, lounge bars, etc. Each user can also have a personalized channel, which can be saved and edited in the future. Quite a few apps can also provide recommendations based on the users' preferences, and detect their location to provide personalized suggestions in their immediate surroundings. Mobile gaming apps are increasingly adding different m-Commerce features such as in-app purchases and integrated payment systems. Mobile games generate revenue by letting gamers purchase virtual currency via standard payment systems. When such games are based on a social networking platform, it gives the app instant access to millions of users as well. Banking apps are increasingly becoming popular amongst mobile users these days. Most of the banks offer regular banking services such as credit card payments, bill payments, on-the-go access to finance and accounting services, etc. to their customer through a dedicated, high-security app. Nowadays, banking apps also push real-time notifications and messages to consumers for daily statements, account transfers, etc. The fast-paced world we are in today, no customer wants to wait. Mobile payment methods have taken the world by storm by minimizing the time spent while performing a transaction. The least enjoyable part of a shopping experience is the payment part and people do not prefer to stand in a queue to do it. Mobile payments have therefore simplified lives not only for the customers but businesses embracing such advanced m-Commerce and mobile payment strategies as well. By using "pay by mobile" modes, customers do not have to worry about the risks involved with carrying cash or credit cards. Moreover, the credit card information is stored securely on the cloud and not on the phone, thereby further enhancing mobile payment security. One of the best advantages of mobile payments is that the user can keep track of all the loyalty and incentive programs at one place. The customer does not have to worry about the various reward points and credits earned by them through their purchases at different retailers, as apps such as Apple Passbook help to keep all information in the same place. Mobile payment is one of the least complicated and easiest methods for performing transactions. Mobile payments allow consumers to purchase goods and services from anywhere and at any time. It also allows the customer to buy products or avail services without having to physically hand over cash or swipe their card. The massively increasing m-commerce domain and the rising revenues generated by mobile payments need to be capitalized on by various businesses. Outsource2india has been providing mobile commerce solutions to global clients for more than a decade now. Our expert team of mobile app developers is skilled in developing apps for different platforms. Some of the projects we have worked on can be seen here. If you have any m-commerce or mobile payment solution requirement, feel free to share your idea with us, and we will get back to you within 24 hours.